Welcome Bing Shopping Campaigns to the US! Here’s What to Know About the New Bing Shopping Campaigns. What began as a beta launch in April has evolved into an inevitable and exciting announcement coming out of the Bing camp: Bing Shopping Campaigns are now available to all customers in the U.S. The April beta launch reflected Google’s recent shift to Shopping Campaigns, which changed how merchants organize and manage product-listing ads. Now that Bing’s made the formal rollout, Shopping Campaigns will eventually become the default campaign type for running Bing product ads. The old way of doings things will head to the online retailer graveyard in the fall. Eventually, Bing Shopping Campaigns will also roll out internationally, although there is no public timeline dictating when. But with Bing, you also have the power to import Google Shopping Campaigns into Bing Ads, as well as import the Google Shopping Feed format into the Bing Merchant Center. This little added touch could help pull more and more merchants away from Google and toward Bing. Time will tell. How do I Get Started with Bing Shopping? First thing’s first. You have to verify your domain in Bing Webmaster Tools. Then, set up an account in Bing Merchant Center. Once you set up a Bing Merchant Center store, you can import your Google Shopping campaigns into Bing Ads or create new campaigns within Bing Ads. Click here for “How to set up a Bing Shopping Campaign” provided by Bing. What’s This Mean for US Marketers and Merchants? This is a pretty big step for Bing in its fight for market share vs. Google. Now that it’s stepped up its game, and made it easy for merchants to import Google data, Bing has forced itself into the online retailer discussion, more so than ever before. If you’re not using Bing yet, this is the absolute perfect time to do so. 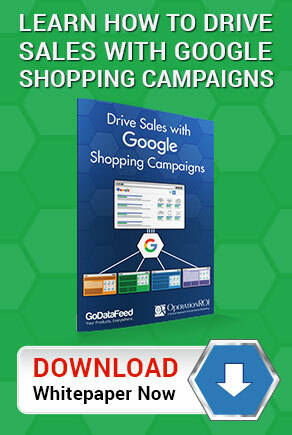 Being able to import Google campaigns and feeds gives you great flexibility and power, without having to endure the headaches typically involved in creating new campaigns. That being said, there is still a learning curve involved. You also have to consider what types of campaigns will be effective with Bing. Remember, just because something works well with a Google audience doesn’t mean it’ll translate to Bing. Before you invest too many man-hours into your Bing campaigns, take the time to determine which products or campaigns are best to focus on in Bing’s new Shopping Campaigns. OperationROI can help. As experts and certified in both Google and Bing environments (including having closely studied Bing Shopping Campaigns since its April beta release) we can help you push forward with Bing Shopping Campaigns in a responsible way that has you enjoying the greatest return on investment. Contact us today, by calling 1-888-277-5429 or filling out our contact form, to learn more about how we can help you make the most of Bing Shopping Campaigns.